The new season started with a winner for the stable on Wednesday and we have two chances to add to that at different venues on Saturday. Rhythm To Spare runs at Moonee Valley and Dodge City is resuming at Wangaratta while Lord Barrington will stay at home. Rhythm To Spare, pictured after his gallop on Tuesday, runs in race seven, the Ladbrokes Cash In handicap over 1600m with Lachlan King claiming and jumping from barrier three. The now nine-year-old has been racing well without winning and Mike Moroney feels his disappointing last start at Flemington can be attributed to the firm track. “The bit of rain we had overnight has certainly helped and Moonee Valley is a bit more forgiving so that will certainly help him,” Moroney said. “He’s been desperately unlucky in a couple of his races and certainly better than his figures look on paper. “His work has been great, we can’t fault him on looks, he’s freshened up well and drawn nicely. “The claim is crucial, it gets him down just above the minimum which for a horse like him is a luxury. Dodge City resumes in the sixth race at Wangaratta, the Benchmark 58 Handicap over 1590m with Patrick Moloney to ride from a wide barrier on a heavy (9) track. “He’ll need a little bit of luck from the draw but it might not be too bad later in the day on a heavy track,” Moroney said. 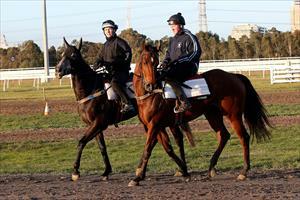 “I’m particularly happy with the horse - he’s come back stronger, he looks terrific and has been working accordingly. Lord Barrington was an intended runner at Moonee Valley but has been scratched due to a foot problem.